The mismanagement of the Heehs affair by the Ashram Trustees has become a national issue ever since Heehs’ deportation order was discussed in the national media. 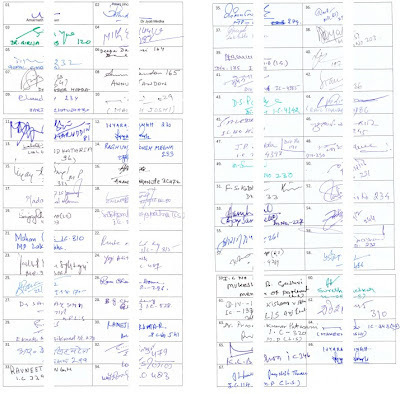 Sixty-eight sitting Members of Parliament (MPs) have signed a letter seeking clarifications from the Ashram Trustees. The list of signatories includes sitting Cabinet Minister Shri Srikant Kumar Jena, Ex Chief Minister of Bihar Shri Lalu Prasad Yadav, Ex President National Commission for Women Dr Girija Vyas, etc. The letter was mailed to the Ashram Trust Board by Ex-MP Dr Kartikeswar Patra who then sought a meeting with the Board to discuss the issues raised by the Hon’ble MPs. Unfortunately, as is the habit of our present Trustees they played a dirty game of deception and outright lies. First, they tried to prevent him from meeting the Board. When he insisted on the meeting, they refused to permit his colleagues to attend the meeting, although they had their assistants present throughout. In the meeting they asked for another two months to reply to simple questions that everyone has been asking for the last several years. When Dr Patra insisted on an immediate reply, they promised to give a written reply the same evening, and then late at night sent an unsigned note saying they will take several months to reply as suggested by him! This is not only an insult to the signatory MPs but also an insult to the Indian State and the People of India whom the MPs represent. Inebriated with their extreme arrogance, the present Trustees have lost all sense of propriety and basic values. They are trying to deal with Members of Parliament with the same high-handedness with which they deal with Inmates of the Ashram. Perhaps the years of exercising absolute power on utterly dependent and meek Ashramites has caused these Trustees to lose touch with reality. Having entrenched their autocratic rule in the Ashram, they want that the whole of India also must bow down to their whims and fancies in the same manner as Ashramites are being forced to do every day for the last 20 years! Below are the two relevant letters. 2. Letter of Dr Kartikeswar Patra after he was snubbed and deceived by the Trust Board. Sri Aurobindo is a national and international figure widely recognised as a freedom fighter, national leader, yogi, philosopher and poet. Over the last hundred years his writings have increasingly inspired people all over the world by their depth and insight and their inspirational and practical content. He is revered and worshipped by millions of people in India and abroad. The controversy surrounding the book The Lives of Sri Aurobindo by Peter Heehs, an inmate of the Sri Aurobindo Ashram, has raised questions and issues which require immediate clarification and resolution. As you will agree, while the Ashram community in Pondicherry is representative of the worldwide followers of Sri Aurobindo and the Mother, the Beneficiaries of the Sri Aurobindo Ashram Trust (a public charitable Trust) number in millions and are spread all over. As Trustees of the Sri Aurobindo Ashram Trust you remain answerable not only to the immediate community in Pondicherry but to all Beneficiaries wherever they be, in India and the world. As Members of Parliament from various States, we the undersigned deem it our duty to speak on behalf of the people we represent and raise the issues that concern them. Besides there are matters of national interest and security and these need to be considered in all their details. We would be obliged if the following questions are answered by you at the earliest. 1. The ambiguity of the Sri Aurobindo Ashram Trust with regard to the book by Peter Heehs is intriguing and disturbing. You are on record as having stated that the book has “crossed all limits of simple decency!”, that the book does in fact “denigrate Sri Aurobindo”, you have warned of its “potential danger”, the need to ensure that it “should reach as few readers as possible”, and you also claimed that he had “initiated” “a few corrective measures” with “more on the anvil”. You have confirmed that Peter Heehs has impersonated himself as the “Founder” of the Ashram Archives to give his book credibility, and you claimed to have initiated “disciplinary action” against him. Manoj Das, scholar of Sri Aurobindo’s life and multiple National Awards winner and a former Trustee of the Ashram, identified ninety passages in the book that he found damaging to Sri Aurobindo and his Ashram, and read out each one of them to you explaining why and in what manner they were harmful. He asked for and received your promise to stop the book and remove Peter Heehs from the Ashram. However we find that your recent media releases and statements are the exact opposite of your earlier position. You seem now to support and promote Peter Heehs and his book. What is strange is that you profusely quote supporters of the book who are not scholars of Sri Aurobindo and whose first point of contact with Sri Aurobindo is through this controversial book, while you deliberately and entirely ignore the extensively documented criticisms of the numerous longstanding scholars of Sri Aurobindo’s life and teachings. It is to be noted here that these extensively documented scholarly objections against the book numbering in hundreds have not been responded or scholarly refuted to by Peter Heehs or for that matter by any other scholar during the past four years giving credence to the conclusion that the book is defamatory, denigrating and perverse. Please explain the reasons behind your change of mind and your new public position as well as your obvious bias to praise the book. Are you under pressure from some external agencies? 2. Peter Heehs by his letters dated 24.9.2008 and 13.10.2008 addressed to you has confirmed his a) violation of copyright, and his b) not being the Founder of the Archives. Additionally the erstwhile colleagues of Peter Heehs at the Ashram Archives by their letter dated 8.9.2008 had complained and brought to your notice the theft of the Ashram’s intellectual property. Late Shri Pranab Kumar Bhattacharya vide his letter dated 5.8.2009 had listed numerous and serious criminal lapses of Peter Heehs in the publication of this book. In spite of the above, we find that you have initiated no legal or criminal actions against the author nor against the publisher Columbia University Press in order to safeguard the intellectual property assets of the Sri Aurobindo Ashram. Please explain this apparent dereliction of duty as the assets of the Sri Aurobindo Ashram belong to the Beneficiaries in particular and the public at large and one individual cannot be permitted to gain financially at the cost of the institution. 3. The Government of Odisha vide its Extraordinary Gazette Notification dated 9.4.2009 has proscribed the offensive book and has stated unambiguously that the sole intention of the author Peter Heehs is to denigrate and defame Sri Aurobindo and to create communal strife and tension within the country. This is a very serious indictment and yet you have continued to harbour, shelter and promote Peter Heehs within the Ashram community and have issued letters to the Ministry of Home Affairs recommending extension of his visa! Please explain this very serious lapse and this anti-national stance given your position of responsibility in a public charitable institution. 4. What is extremely disturbing and worrisome is that the nationwide public condemnation by devotees and disciples alike is falling on deaf ears. There appears to be no attempt from your side to explain, reconcile or resolve the problem. Things have gone from bad to worse in the last 4 years and the recent public protests and dharnas by devotees have brought public attention on your lapses. What is even more disturbing is that you have initiated legal action against very senior and responsible members of the Ashram, academics and professors for taking part in the public protests and for making statements to the Press. Please explain your attempts to gag the inmates and devotees, and your avoidance of any attempt at clarification and reconciliation. 5. Over many years now there has been a growing concern and chorus regarding the manhandling, theft and abuse of the original manuscripts of the Mother and Sri Aurobindo stored at the Ashram Archives. It must be noted that these are priceless national treasures and of immeasurable spiritual and cultural value. These are not in safe hands as has been demonstrated by Peter Heehs’ violation of copyright and alleged abuse of intellectual property as well as the numerous accusations of his tampering with Sri Aurobindo’s writings. In view of the above, it is imperative that an independent and external audit is conducted in order to assess the damage as also to verify inventory. Please explain why no such action has been initiated by you so far. 6. The recent public outrage over the misconduct and alleged racial abuse by Dilip Datta, one of the Trustees, and his daughter with regard to devotees of Odisha is a matter of serious concern. Please explain why no action has been forthcoming from the Trustees to address the issue by taking appropriate steps against Dilip Datta and tendering a suitable apology by the Trustees to the People of Odisha in spite of petitions with thousands of signatures which have been submitted to you. 7. It is found that there are over 160 Court cases against you as Trustees of the Sri Aurobindo Ashram Trust filed by the inmates of the Ashram and pending in various Courts all over the country. These cases involve serious violation of human rights, sexual abuse, financial impropriety, abetment of murder, etc. It is deplorable that a spiritual organisation should have so many cases filed against it by its own inmates within the short span of the last 15 years, and reflects a deep malaise and complete failure of administration. Please explain what has gone wrong with your administration in the last 15 years, and what steps you have taken to cultivate internal transparency, democracy and administrative reforms. It is imperative for us to know how much money has been officially spent by the Trust on these legal matters, and whether inmates of the Ashram and Beneficiaries were taken into confidence. The issues raised above deserve your urgent attention and a detailed response at the earliest as they are of concern to large numbers of Devotees of Sri Aurobindo and the Mother all over India. This is a matter of national interest. 1. With regard to the above and with reference to our meeting, I place on record my deep disappointment and regret at the deceitful behaviour unbecoming of Trustees of a spiritual institution and of a public charitable Trust that was displayed by you and your fellow Trustees. 2. While the letter requesting clarifications by the MPs had been sent to you by Registered Post earlier, and you had adequate time to prepare a reply to the clarifications sought, it was unfortunate that an attempt was made by Shri Matriprasad to prevent me from meeting the Trust Board members. It is only upon my insistence that today’s meeting was arranged. 3. I began the meeting this morning by reiterating that I have come here to meet you in a spirit of goodwill and not of confrontation in order to convey the concern of a large number of Members of Parliament at the state of affairs with regard to the administration of the Sri Aurobindo Ashram Trust. 4. Upon being told that you would take two months or more to provide replies to the questions raised by the Hon’ble Parliamentarians, I expressed shock and disappointment at your frivolous approach to a serious and pressing matter. I was then assured by you personally that you would reconvene in the afternoon and provide me with a detailed written reply to the queries of the Hon’ble Members of Parliament as also a signed Minutes statement of the meeting by 5.30 pm today. 5. To my utter shock and dismay, this evening no written reply was provided, and I was handed over an unsigned statement of the Minutes of the meeting full of false statements. It is falsely stated inter alia in the unsigned Minutes that I have agreed that you could take as much time as you wish to reply to the queries of the Hon’ble Members of Parliament. I deny this emphatically and remind you that the matter is extremely serious and an urgent response is due from your end. 6. Your deceitful response and handling of the matter is disrespectful of the Members of Parliament who are elected representatives of the People of India, and your attitude deserves to be condemned. 7. It is more than evident that you do not wish to face the issues at hand and provide the necessary clarifications as requested by Hon’ble Members of Parliament. This is irresponsible and deplorable. 8. I shall convey the above to the Hon’ble Members of Parliament. The Ashram Trust Board has lost its stability and become very weak to uphold the ideal of The Mother and Sri Aurobindo. Besides they are becoming violent and adopting falsehood to hide the truth. The disrespectful attitude and behaviour shown to Dr.Patra ex. MP and other 68 Members of Parliament through him is shameful.As per The Mother's word: unless one is weak one can not become violent.They are prohibiting the sale of Peter's boook in Ashram Departments, on the other hand supporting Peter outside. It proves their double-dealing and lackness of courage to face the truth.More amazing matter is that about 160 cases have been lodged by the inmates against Ashram Trust and a huge public money is being spent on it unnecessarily by delaying solutions.They are controlling other sadhaks and sadhikas-inmates by taking vindictive action against them but can not control themselves.The Trustees of world's most adored spiritual institution should realise this and eliminate unnecessary egoistic confrontation, otherwise quit for a better tomorrow..
A MAJESTIC STEP TAKEN BY THE DIVINE. VERY SOON WE SHALL REJOICE! LORD KRISHNA WAITED PATIENTLY 99 ABUSES FROM ASUR SHISHUPAL NOW IT IS 100TH AND IT IS OVER. THE ASHRAMITES WILL BREATH FREELY AND FEARLESSLY. LET THE MOTHER'S WILL BE DONE. Whatever the questions or clarifications sought by the 68 MPs, they are not new and have not come suddenly like bolt from the blue for the trustees of the Ashram. A complete answer should not take more time than needed for dictating and typing it out. One day is reasonably enough. It sounds mysterious, indeed, that Matriprasad wanted 2 months' time for that. The Ashram is a spiritual institution giving light to seeking humanity. It is on record that Sri Aurobindo himself took all the pains to answer all the queries of seekers even by working late at night every day. The trustees are not ignorant of whatever is happening over the years in general and over last 4 years in particular since the publication of Peter Heehs' controversial biography of Sri Aurobindo. If they need 2 months' time to give a reply to the public (represented by the 68 MPs), then the whole matter is too obvious to be brushed aside by anybody, disciple or no disciple of Integral Yoga. That is what is the reality now implied by the present Trust body managed by Manoj Das Gupta. There seems to be no response as yet to a large section of Indian citizens represented by the 68 MP's. Obviously Mr. Manoj Das Gupta has acquired the audacity to refute people just like that, taking here a two months' holiday, as indicated by his piggish A.D.C (Matriprasad). Probably by that time he may be able to dismiss all queries with convenient quotes from numerous sages, Sri Aurobondo and the Mother and focus on a point that, after all, a writer (Peter Heehs here) is entitled to his/her freedom of expression and that anybody's freedom should not be curbed as a right. He may also comfortably say that even great scripture like Gita enjoins on one to be above all praise and blame in spiritual life.In a sweep thus the 68 MP's will be floored down by him for any number of questions for as long a time as he likes. Four decades of mischief-mongering, labour of a criminal nexus, all hypocrisy and insincerity of the present trustees -- not an easy matter to smash by words and arguments. WE CANNOT EXPECT ANY REFLECTION OR EVEN DISPLEASURE FROM THICK- SKINNED, INERT, AND HEARTLESS FELLOWS. NOTHING CAN STIR THEIR THEIR CONSCIOUS. OUR CRY, RAGE, SHOUTS ARE ALL IN VAIN. WISH THE GODESS DURGA TAKE ACTION THE WAY SHE CHOOSES. It is heartening that some conscious members of parliament have taken note of the current mess by the trustees at Sri Aurobindo Ashram, Pondicherry. Their above letter of 15 May 2012 has almost summarised the burning issues of the day. This letter provides a voice to our collective agony. Most of these points were in the minds of the devotees, but we were clueless about raising these questions, since the ashram trustees never replied to any question, directly. Wherever possible, such questioners were reprimanded or harassed and repressed. Thus, a virtual reign of terror prevails at the Ashram. This disease has spread even to the supporters of the trustees. The time has come for a just resolution. We, the devotees, feel ashamed at the childish and apathetic behaviour of the trustees towards Dr. Kartikeswar Patra, an Ex M.P, who visited ashram on behalf of the parliamentarians, to collect the response of the trustees. This action by the managing trustee shows in very poor light, his confused and troubled state of mind, his lack of due respect and courtesy to a letter signed by 68 parliamentarians, his scant regard to public opinion of any sort or in any form, his excessive and obsessive love and support for Peter against whom his ears are sealed to any sane suggestion, his apathy to the eventual wellbeing and standing of this venerated ashram, and his misplaced faith in the misuse/abuse of money-power, muscle-power and coercion to rough-ride on all others. The sooner such persons quit their seat of power, the better it is for the Ashram. Their activities and abuse of power is highly incompatible with the laudable standing of the Ashram, as a creation by the Mother and Sri Aurobindo, and a Govt recognised public charitable Institution. That such an organisation is currently embroiled with 160 court cases is shameful, to say the least. We pray the Mother to guide all concerned and help restore harmony and order. I express deep gratitude to the Hon. Ministers, Hon. Members of Parliament for representing strongly the wounded feelings of the followers of Sri Aurobindo and the Mother to the stone deaf Trustees of Sri Aurobindo Ashram Trust, Puducherry. I hereby further request to kindly move the other Hon. MPs, dignitaries as this is not only a small problem in a remote corner of the country, but has been hammered brutally on the soul of India; it is a calculated and mischievous blow on the spirituality of India, which is our breath, wealth and life. We have lived through centuries by such nectar offered by our sacred Rishies and Vibhutis who chose this land. We cannot allow such blows, cannot bear them anymore, cannot remain silent now. We cannot afford to remain on the safe fence and watch the show! Such passivity is nothing but nurturing the present falsehood which has smartly attacked our lord Sri Aurobindo. In this context, I humbly appeal to all managers of public life, to all who have deep love for Bhartiya Sanskriti and spirituality for pursuing the initiated action by the Hon. M.Ps and well wishers. We shall continue the holy Yagnya set aflame by the loving Mother for the upliftment of humanity and for the transformation of our consciousness in spite of the attacks by dark forces. "AA YAA HEE SATYA AAVIRBHAVA"
We must fight such deliberate attempts to under mine Indian Spirituality with all our strengths and resources on hand.